The opening round of 2011 Malaysia Rally Championship (MRC) concluded with Fan Fan fends off the challenge from MRU Motorsports’s Rafiq Udhaya to grab the win at Tai Tak estate in Kota Tinggi, Johor. Representing Soueast Motor Kumho Team, Fan Fan was consistent throughout the 15 super stages event and finished the rally in 03.44’30.6s. With co-driver Junwei Fang, Fan Fan had a great start and leading the MRC classification with 3’05.3s advantage over Rafiq on Saturday. With a healthy lead on top of the leaderboard, he pace himself on the final day to mark his return to Malaysia rallying scene after a five-year absence with a winning note. Defending MRC champion Rafiq and co-driver Sean Gregory registering better time against Fan Fan in the early stages. But a gearbox problems to his Subaru Impreza made him spent a lot of times in the service centre. He successfully change the gearbox but at the same time incurring a penalty that cost him 4’30.0s. This put him into second place behind the Chinese rally driver. On Sunday he pushed very hard to close the gap but not much he could muster as the final 7 stages were short distance stages. With the deficit only came down to 2’50.0s, Rafiq had to settle for second best and relinquished the title he won a year ago. 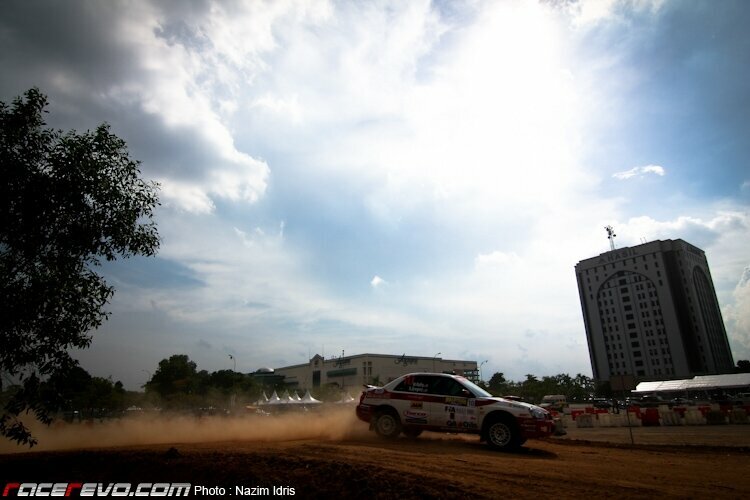 Aji Kim and partner Noriko Takeshita came in a surprised third place ahead of many big name in Malaysian rally scene. The Japanese made it a 2-3 finish for MRU Motorsports to edge rival GSR Pennzoil Racing Team in the fight for overall team trophy. Finishing behind them was Shazly Ilias, Kenneth Koh and Wan Mohd Hafiz who crossed the finishing line in 4th, 5th and 6th position respectively. Bad luck again befell on 3-time APRC champion Karamjit Singh. For the 3rd year in a row he had to retire in Malaysian Rally, and this time around a wheel came loose while he was negotiating the SS3. GSR Pennzoil Racing Team’s Karamjit Singh with Saladin Mazlan in the background. Saladin comeback from one year off hit a bad start as he too couldn’t finish the race. But with his new Mitsubishi Evo X, Saladin will no doubt be pressing for honours in the upcoming rounds of MRC in Perlis. Gunaseelan Rajoo had it easy this time around, cruising in a new Satria Neo after his Suzuki Swift could not be ready in time for the rally. But he was confident that the Swift will be in place when he continues his APRC challenge starting with Rally of Queensland in May. Three silver coloured Satria Neos, Gunaseelan’s Pennzoil Racing Team ahead of two Neos of Proton Cusco Racing Team. This year’s Malaysian Rally saw new APRC Junior category were introduced, with 2 participants from the 2 Neos of Proton Cusco. Kosuke Takashino finished narrowly behind his compatriot Akira Bamba in the new category for young drivers in Asia Pacific region. With a lot of foreign participants in this year’s championship, it will be interesting to see local talents going up against drivers from China, India, Hong Kong, Japan, Australia and Great Britain. Last year’s champion Rafiq will be defending his title against 4-time APRC champion Cody Crocker, multiple MRC and APRC winner Karamjit and local favourites such as Saladin and Gunaseelan. Sean Gregory, co-driver of MRU Motorsports principal driver Rafiq Udhaya. Another battle to look forward to is between MRU and GSR Pennzoil for the rally team supremacy, with both teams registered top drivers in their lineups. The top three finishers celebrates on the podium.